Archives of Eaton Bray News for August 2007. This article was published in August 2007. Please see Latest News for more recent information. After more than a year of heated debate, a controversial new rubbish collection system is finally set to start around Dunstable and Eaton Bray next week. 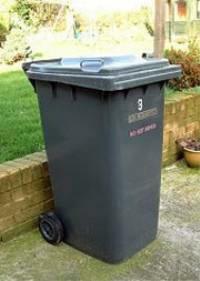 From Monday, September 3, householders in South Beds can expect their black bins to be emptied one week, and their orange-lidded bins the next. It has been described as a way of increasing recycling rates, and a South Beds District Council spokesman said a smooth transition was expected. He added that new recycling bins and collection calendars were being rolled out across the district, and everyone should have them by Friday. But as the big day draws closer, councillors and council staff will be acutely aware of the disquiet the measure has caused since it was announced last year. Earlier this summer a petition by the UK Independence Party (UKIP) collected more than 3,000 signatures calling for a rethink. UKIP office manager Peter Cole said that it would lead to an increase in fly-tipping and vermin, and said that any maggots he found in his bin would be delivered to council offices. But the council pointed out that with landfill space running out fast and huge government fines on the horizon, something needed to be done to reduce the amount of rubbish going into landfill. Councillor David McVicar, who has responsibility for the environment, said: "We're running out of holes to put our muck into. We're not in a position to say we can put what we want into a bin and it'll go into landfill. The landfill will not be there." He added: "Other authorities have had this reaction, but within a matter of a short time that fear has been allayed and people say there are no problems." Morrants Four Counties League - Not for the first time this season the weather was the winner last Saturday with no league games completed. Eaton Bray lead Great Brickhill by two points as the league enters it's final two weekends. Bray (14 points) were 197 all out on Saturday when the weather intervened against New Bradwell (15), James Flecknall top scoring with 77 with Paul Harris adding a useful 42. Zed Khan was the pick of the Bradwell bowlers taking 4-23. Second placed Brickhill ( 13) had Newport Pagnell Town (13) on 153-6 when the rain came, Paul Braddy hitting 54 while Stuart Cooper picked up 3-37. MK City were 133-8 against Cublington (14) and Winslow (13) were 161-8 with Paul Tomlinson hitting 75 against North Crawley (14). Mentmore's failure to fulfil their fixture against Milton Keynes sees them relegated. Tring Park picked up 12 points from their abandoned game with Olney Town (12) in Division Two, Ben Caddigan scoring 42 of his side's 148-4. Aspley Guise (13) were well on top of Stewkley (10) at 151-1 when it rained, John Rowbotham and Grant Webster on 56 not out and 58 not out respectively. Richard Blake of Studham (12) was 62 not out in Studham's (12) 137-4 against Old Bradwell while Aston Clinton (11) were 101-2 against Turvey (11). Edlesborough picked up 12 points to Soulbury's 11 in their rained off game. In Division Three Caddington's home game with Drayton Parslow and Milton Bryan's clash with Shenley Church End did not get started. Open University took this opportunity to go top by picking up 15 points from their abandoned game against Eaton Bray 2nds (10), Bray 99 all out with Sohail taking 5-39. Biddenham (15) were 24-0 in reply to Eggington (11), who were bowled out for 122 while New Bradwell 2nds (15) bowled out Steeple Claydon (11) for 121, Subhan Shafiq taking 4-15. North Crawley 2nds (12) stay top of Division Four after the match with Stoke Hammond (12) was abandoned after Crawley 2nds had scored 128-5 with Jim Armstrong scoring 34 not out. Whitchurch (12) were 144 all out against third placed Totternhoe (15) while Cranfield University (15) bowled out Great Brickhill 2nds (12) for 147 with Andy Higgs top scoring with 43. Bottom side Old Bradwell 2nds (10) were 98-7 thanks to 51 from Vinod Tailor when play with Milton Keynes (13) was abandoned. Willen (15) were well on the way to victory against Harlington when the weather thwarted them, Willen on 55-0 in reply to Harlington's 135-8. MK City 2nds gained 12 points from their rained off match with Cublington 2nds (12) and was enough to clinch promotion from Division Five. Printers look set to join them as they picked up 13 points against Little Horwood (10). Tring Park 4ths (13) had Olney Town 2nds 70-6 when they were stopped by the rain and Milton Bryan 2nds' home match with Stewkley 2nds and Wing's clash with Winslow 2nds did not start. In Division Six, Newport Pagnell Town 2nds (14) now hold an eight-point lead over Ivinghoe and Pitstone (11) following their meeting. Ivinghoe were 109-8 with Steve Cordory taking 4-30 before the heavens opened. Wolverton Town 3rds (13) were 140-8 when the game was called off against Eggington 2nds (14). MK Park 3rds scored 198-9 against North Crawley 3rds with Raza Ifthikar hitting 57 not out and Nick Cooper taking 5-35, each side picking up 14 points. Eaton Bray campaigner Alan Woolridge said he feels like a celebrity as his battle against the council's alarm notification strategy gains momentum. He has been featured on television and radio programmes in the past week, and says people have congratulated him in the streets for making a stand. But chiefs at South Beds District Council say they cannot work out why the policy has created such a fuss. As reported previously, South Beds is the first district to have an alarm notification area introduced. All burglar alarm owners face £80 on-the-spot fines if they do not hand over details of their keyholders, and this could rise to up to £1,000 if the council takes them to court. It was introduced so that if an alarm sounds, council officers could contact keyholders to silence it. Councillor David McVicar, who has special responsibility for the environment, said: "It's an issue that shouldn't have caused all the problems it has. "It was a thing that was put into place to help, and it's ended up being a stick with which we're being beaten." He said councillors chose to implement government legislation to combat the nuisance that alarms can cause. On average, problems arise once a fortnight, and Mr McVicar said: "It's a huge number when people are being driven mad." And he continued: 'At one stage it was down to the police to hold a voluntary database but that fell into disrepair. People would phone us up and say: 'There's an alarm going off'. If that happened, Peter Jones, corporate service manager, said council officers had to obtain a warrant, a locksmith, a police officer and an alarm engineer to gain access to the home. Mr Jones said that with all costs being transferred to the householder, it could work out very expensively. And he added that keyholder details have already been used to get alarms turned off quickly. "Something that would have taken hours of annoyance was dealt with by one phone call," he stated. A lot of the controversy has been about the security of the information the council collects. Mr Woolridge has said he is prepared to submit mobile phone numbers for his keyholders, but not names and addresses. But Mr Jones said: "The advantage of having a name and address and a phone number for the keyholder is we've got a better chance of getting hold of them." He added that under the government legislation in place, addresses have to be collected. Critics have said that the keyholder database could be a massive resource for criminals if it fell into the wrong hands. In response, Mr McVicar said that the council has never had a problem with data being compromised in the past. He stated: "No security is 100 per cent, but as far as this council is concerned, we've never lost a piece of data." He said that the council already has huge databases containing enormous amounts of data about people living in South Beds, from benefits information to council tax and the electoral roll. All officers with access to the keyholder database are CRB checked, and Mr McVicar said: "I would never question the integrity of our officers." An online petition about the measure was loaded by Mr Woolridge onto the 10 Downing Street website. As the Gazette went to press more than 70 householders had signed it. Did you know that by 2021, there will be 26,300 new homes in Luton and South Bedfordshire? The Government wants to increase housing supply in the South East and has identified South Bedfordshire and Luton as part of the 'Milton Keynes and South Midlands Growth Area'. South Beds District Council, along with Luton Borough Council and Bedfordshire County Council has been charged with delivering this growth, but we also need to deliver the jobs, schools, shops, community facilities and other important infrastructure that must go alongside it. Growth is coming, but in order to ensure that it brings benefits to the area and those who live here, we need to involve as many people as possible in making important decisions. From 30 June until the end of September, the first stage of our on-going growth consultation is taking place. During this time we will be seeking public opinion on different options for where the growth could go (including an option which includes village expansion). We also want to know what you think about some other issues that need to be addressed alongside the growth, such as how we will travel, where we will work and how we will ensure that our new communities are sustainable and inclusive. There are many opportunities to find out what is happening and have your say, including exhibitions in public locations, a summary leaflet (which was delivered to every house) and questionnaire and a website containing more detailed information; including the Core Strategy Issues and Options Paper which discusses the issues mentioned above in more detail). The exhibition will be at Eaton Bray Village Hall on Tuesday 4th September from 5pm until 8pm. Please note that the exhibition will also be held in some other villages on different dates, so if you cannot make this date, there will be other opportunities to visit the exhibition. Please go to www.shapeyourfuture.org.uk for a list of village exhibitions or call 01582 474068. Address: Development Plans, South Beds District Council, The District Offices, High St North, Dunstable, LU6 1LF. An opportunity will occur in September 2007 for a Youth Club Leader in Eaton Bray as the present Leader will be leaving. This established and successful club provides a vital and rewarding position giving an essential facility for young folk in the village. To organise and oversee Youth Club Activities at the Coffee Tavern as well as on special arranged outings. To liaise with the Bedfordshire Rural Communities Charity Team and Luton & Beds Youth Association on organised events. Two experienced helpers and a treasurer and the Parish Council. Help for special projects from the Bedfordshire Rural Communities Charity Team & L & B Y A. A monthly salary during school term time. For further information contact M Beal or apply to The Parish Clerk. A website especially for young people in South Beds is going from strength to strength after its first year. FunkeeMunkee.co.uk was set up to provide health and social information for youngsters, and it is fast become a crucial resource in the district. As well as carrying information about events in the area, it is also packed with links to useful agencies which can help out with all kinds of problems and concerns. The website is run by Alcohol Services for the Community and funded by the South Bedfordshire Local Strategic Partnership. Rachel Keith from Alcohol Services for the Community said: "It's going very well, there's a growing amount of information on there. It's very colourful and it's growing in content all the time." The website was set up so that youngsters all over the district don't miss out on important events and health information. Rachel added: "South Beds is like any area, it's got a mixture of communities. The idea is that the website is for people who don't hear about things and who miss out on what's going on. Now they've got this place that gives them all the information they need." So far Rachel said feedback from young people has been good. One website user enthused: "I like the look of Funkee Munkee. It's interesting and eye-catching and the graphics are good too." Another added: "Information, events, real people, competitions and a. really happy monkey - what more could you possibly want?" As well as guest columns from a number of local organisations, the site also boasts book reviews and theatre listings. And true to its name, the site also sponsors an African patas monkey called Chibber. There has already been a FunkeeMunkee site running in Mid Beds for three years. The website name was picked out by youngsters ahead of its launch. 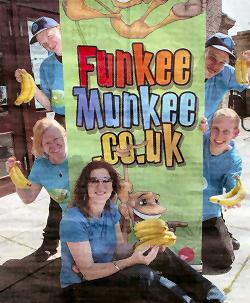 To celebrate the big day in South Beds, members of the FunkeeMunkee team hit the streets of Dunstable and Houghton Regis to give out free bananas and goodies. Website volunteers Robert Day, Timothy Day and Nick Porter, and co-ordinators Helen Reynolds-Smith and Alison Colver are pictured, above outside The Place in High Street North, Dunstable. An online petition has been launched to protest about the district council's controversial alarm notification policy. Burglar alarm owners are now required to pass details of their keyholders to South Beds District Council, or face fines of up to £1,000. The council claims it will help to silence loud alarms quickly, and there are already cases where keyholder information has been used to cut short the misery that constantly sounding alarms can cause. But as reported by the Gazette last week, the measure has sparked concerns about security. Eaton Bray protestor Alan Woolridge has vowed to battle against the order, and this week he has launched a petition on Gordon Brown's 10 Downing Street website calling for a rethink. South Beds is the first area to bring in the measure using legislation from the Clean Neighbourhoods and Environment Act 2005, but a number of local authorities are keeping a close eye on the initiative. Mr Woolridge is calling on the government to have another look at the legislation before other authorities follow suit. His petition reads: "Homeowners in South Beds whose property has a burglar alarm are being legally forced to pass details of a keyholder (name; address; phone number) to the local authority. "Other councils will follow. This protest is about the creation of databases that if allowed to continue will identify properties that have, and by exception, do not have burglar alarms. "Front door key security is personal and the whereabouts of any `emergency' keys are confidential too." The petition urges householders not to submit keyholder information, or to withdraw it if they have already handed it over. When the alarm notification area was announced last year, it prompted a number of letters to this newspaper voicing concerns. Enforcement of the policy started this month, and since we reported it the Gazette has received many letters and phone calls on the subject. This week one correspondent wrote: "Having worked with IT systems since the late 1960s I know it's inevitable that information on the keyholder register will get out, no matter that the council is `fierce' with its data protection duties to prevent data being misused. "Information will get out either because someone breaks in, or because a loophole has inadvertently been left in the system, or because a South Beds District Council employee is suborned into revealing information from the database." The website claims that whenever a serious petition collects 200 or more signatures, officials at Downing Street will ensure a response is given to the issues raised. 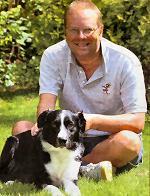 Meet Cookie, a young border collie whose tail's finally wagging again after a terrible ordeal. Cookie was one of the dogs caught up in the horrific blaze at Appledown Kennels at Eaton Bray last Wednesday, which claimed the lives of three pets. He was staying there while his owners holidayed in Spain, and it was his boarding block that caught fire in the early hours of the morning. Firefighters rescued him from his pen, and he was dramatically revived using an oxygen mask. Staff and volunteers still feared Cookie wouldn't make it, but the young dog, who celebrated his second birthday last week, showed his resilience. His owner, Sandra Dear of Mill End Close, Eaton Bray, said it has been "an emotional rollercoaster" and stressed how grateful she was to everyone who aided Cookie's miraculous recovery. "He doesn't seem traumatised by it at all, he's amazing," she said. "I want to say a big thank you to all the people involved." Sandra and her family went straight to the kennels after touching down at Gatwick airport, and they were shocked to learn about the fire. "My boys were absolutely gutted when they heard the news," she said. "They'd phoned my dad but he didn't want to phone me with the bad news while I was on holiday." Panic turned into relief when they found out that Cookie was alive, but vets still feared that he was going to lose his sight. Thankfully that didn't turn out to be the case, and the young canine's now being treated with eye-drops to help him recover fully. Cookie was treated at the Julia M. Boness Veterinary Hospital in Barton Le Clay, where staff sat with him 24 hours a day until he'd recovered. Even after the trauma of the past few days, Sandra said she wouldn't think twice about taking Cookie back to Appledown. Julie Shelton, who owns the Harling Road kennels, said: "It's so great because everyone thought he hadn't made it. It's fantastic news." Julie was on holiday when she heard about the blaze, and she jumped straight on a plane home, leaving her family behind in Canada. She said that staff at the kennels were devastated that three dogs had died in the blaze, which has been put down to a freak accident. A German shepherd and a rottweiler died at the scene, and experts were unable to save a labrador, which died later. The kennel owner said: "It was an awful thing to happen, it's really traumatic." But she added that she'd been touched by the response the kennels have had from the local community, where lots of people have pitched in to lend a hand. "It's been heart-warming that people have come in and helped us, it's unbelievable," she said. "Still we're having phone calls. The majority of people are asking what we need. It's out of this world." Ms Shelton said her staff had done a superb job and was full of praise for Kim Hutchinson and manager Stephanie Flisher for their reaction to the crisis. "The fire services were amazing. We're just trying to find out how to thank them - they need to know how wonderful we think they are," she said. Appledown is continuing to honour existing bookings, and Ms Shelton said that dog owners have been very understanding. 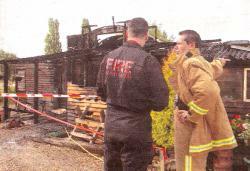 The kennels have been absolved of any blame by fire investigators, and the fire isn't being viewed as suspicious. This September we start our second season. During our first year we have grown to just over 50 members and the society is now on course for another successful year. 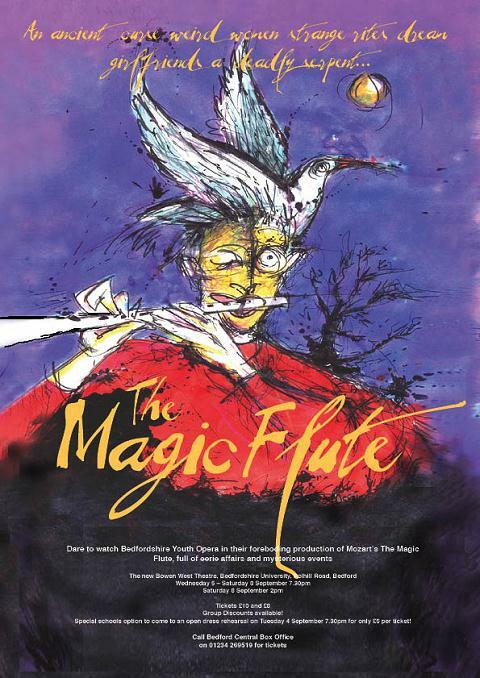 We meet on the second Monday of each month between September and May in Eaton Bray Village Hall at 2.00 pm when we show a film chosen by our members. This is followed by a nice cup of tea and biscuits and a chance to chat. Our films are projected onto a large 13ft by 9ft Screen and we have recently purchased some comfortable padded chairs. Membership is £32 per year payable in two instalments in August and January. If you would like to sample a film, come along for the first time as a guest for £4. For full details, dates and films, please see the Eaton Bray Cinema pages. An Eaton Bray home owner has vowed to continue his battle with the district council over its alarm notification policy, and he is leading calls for a rethink. Alan Woolridge, who has been one of South Beds District Council's most vocal critics since the measure was announced, said he was still unhappy about handing over crucial details about his keyholders. He could potentially face an £80 on the spot fine, which would rise to £1,000 if it's not paid within 14 days. As reported by the Gazette last week, enforcement of the council's controversial alarm notification area has started this month. All burglar alarm owners with an alarm now have to pass contact details for their keyholders to the district council or face a fine. The policy was introduced to cut down on the misery that constantly sounding alarms can cause, as it would give council officers a way to contact keyholders and get the alarms turned off. Members of the council's envirocrime unit will be out and about this month, and if they spot an alarm that isn't registered they will give the owner seven days to comply. But Mr Woolridge is worried that the council wants addresses for the people with keys to his home, and not just phone numbers. He said yesterday: "The security of my front door key is mine and nobody else's, and I'm not prepared to say where it is." And he added: "I don't object in principle to this initiative but I do object strongly to giving a keyholder's name and address. "I have already provided four mobile telephone numbers including my own and thereby given far more options to resolve any problem that may occur." The measure has also prompted concerns that it could become a handy resource for criminals if security is breached. Mr Woolridge said that if the database got into the open, people without burglar alarms and people with dummy boxes would be easy to identify. He said: "The people who are not apparently concerned by this are the people who don't have alarms. "But the people who don't have alarms are the people who would be indirectly identified if this database got into the open. "The people who have dummy boxes and who don't have alarms would be identified as having unsecured properties." He has raised the matter with South West Beds MP Andrew Selous, who has been in touch with the Department for the Environment, Food and Rural Affairs (DEFRA). But the government has said it cannot step in over the dispute. A letter from former environment minister Ben Bradshaw to Mr Selous dated June 26 said that under the Clean Neighbourhoods and Environment Act 2005, local authorities are at liberty to collect keyholder details. It continued: "Databases which contain details of nominated keyholders are maintained in accordance with the Data Protection Act 1998. Local authorities have the power to retain keyholder details for audible intruder alarms as the people responsible for dealing with noise and with the power to deactivate intruder alarms. "As such, Defra are not in the position to intervene in a situation between the local authority, who are responsible for enforcing the fine if they see fit, and the resident." South Beds is the first authority in the UK to introduce the measure. Yesterday a council spokesman said keyholders' addresses are taken to ensure that they live close enough to respond if an alarm goes off. He added that the council is `fierce' with its Data Protection duties to prevent data being misused. A local chiropodist opens her new surgery today in Eaton Bray. The new service, 'Eaton Bray Chiropody', is based within the Trading Faces Hair and Beauty Salon in Wallace Drive. The chiropodist providing it will be Hilary Tomlinson (MSSCh MBChA), who is registered with the Health Professions Council. Hilary will also be treating new patients at the existing Leighton Chiropody Practice in Lake Street, Leighton Buzzard, from September, where she has provided locum cover for the last 10 years. She started as a Registered Nurse who subsequently qualified as a chiropodist and has been in domiciliary practice for 14 years in this locality. Appointments can be booked with Hilary at Eaton Bray Chiropody on (01525) 229111, and at the Leighton Chiropody Practice on (01525) 382900. Our summer Garden Fete was a most successful event enjoyed by all. Special thanks go to Jane, James and Nikki Mcfarland for hosting the day in their lovely home and garden. Thank you also to everyone who came along and supported us and to all members and friends for their hard work beforehand, during and after the fete. A total of £1094 was raised and this has been shared between the Chernobyl Children Life Line and Chapel funds. To conclude the day's celebrations, at 7.00pm, Mr. Mark Topping will perform a drama entitled "Charles Wesley: My Own Familiar Friend". This will explore the life of Charles Wesley to show something of the whole person and not just the gifted hymn-writer. Our Harvest Supper will be held on Saturday September 22nd and tickets will be available from church members. The Harvest Festival Service will be on Sunday September 23rd at 10.30am and led by Rev. Vindra Maraj-Ogden together with our Sunday School. All Harvest gifts will be distributed as previously, the dry/packaged goods to Crombie House in Leighton Buzzard, fresh produce will be purchased by donations and the proceeds and the offertory given to the Methodist Relief and Development Fund and our Chapel. This is always a very special service and we invite you to join us. We resume our monthly lunches on Saturday October 13th at 12.noon until 1.30pm when the chosen charity will be the Keech Cottage children's hospice. Do join us and enjoy a tasty lunch in friendly surroundings and help to support a worthwhile local charity. Next time you are wandering along the High Street in Eaton Bray, look at the people you pass very carefully and try to guess whether they are in the Tennis Club. The chances are that for every 19 people you see, one will be a member, for of the 2,500 villagers, 130 have pledged themselves to our club for the year. Just imagine that, one in every 19 people, so in the village shop at any particular time there could be, oh, say half a member. A wild night out in Café Masala could see three members lurking within, whilst the typical Village dance at the hall could reveal seven or eight of us, or probably a lot more if we're organising it. We are everywhere; in the chip shop, the hairdressers, the off licence, the pub (quite often, actually) constantly on the lookout for an opportunity to whip out our racquets and knock some balls around. The reason I cite membership numbers is because we recently held our most successful recruitment drive ever. The Play Tennis Day up at the courts in June attracted over 100 people who braved a variety of seasons in one afternoon to attend the official opening of our newly re-surfaced courts. They enjoyed tennis taster sessions, my infamous haute cuisine barbecue with new extended menu (hotdog, burger, cheeseburger, all with options of onions and/or half portions, giving an amazing 12 possible pricing combinations and that's before you choose from the four sauces on offer - what other club gives you 48 food options at any of their events? ), anyway where was I, oh yes and local MP Andrew Selous came along to try his hand against some of the youngsters before officially declaring our courts 'open'. We signed up 26 new members during the afternoon - an all time record for one day - and we also announced the re-surfacing and floodlighting of our third court later this year. We've put the all-weather 35,000 seater stadium with retractable roof, multi-storey car park and dual carriageway access up School Lane on hold for a while as our Vietnamese financier Phut Pholt failed to come up with the necessary dosh having re-directed most of it to West Ham United to pay for some Argentinian bloke who it turns out was never theirs anyway and now wants to go to Manchester United where he'll probably play in the reserves for ever. All most unsatisfactory and meanwhile our retractable roof is still on the drawing board at McAlpines. We've had some very successful fund-raising events in the past, and the recent village carnival was no exception, providing that the actual amount isn't too important. Our stall consisted of a large board with an even larger round hole, through which contestants had to throw four tennis balls from about five feet away, and if they got three or more through then they won their money back and a packet of sweets. The cost of all this fun? 20p a go. The number of people who won? Virtually everyone. It was almost impossible to miss. Even with your eyes closed and both hands tied behind your back. We ran out of sweets and had to bring in an emergency supply of pens and then ran out of them too. We ran out of money pretty soon afterwards. Fortunately our Treasurer had the foresight to bring along some used tubes of balls which we hastily sold for 50p a tube and then hurriedly packed our stall away before any more punters could come along and wipe us out again. After much counting and double counting late into the evening, our treasurer was delighted to announce that after five hours work involving six people, we had made the princely sum of £9.47. Unfortunately that's before we've paid the carnival committee for the pitch, so here's hoping it's less than a tenner or we're all in trouble, and that third court might have to wait another few months! For any further information about the club, including when we get together for our social tennis sessions up at the School Lane courts, or our various activities, please contact either Chairman Ross Bagni, Coach Nick Boys, or if they're all out and I'm not sat outside the chip shop with my cap in hand begging for a few pence to pay the fete committee, me, Andy Cross. PS: We all learnt from this. Next year, smaller hole, bigger balls and 50p a go, with no prizes except the satisfaction of having won. Should have them flocking in. We should make a tenner at least! Going into the 2007/2008 season we have 10 teams, including two girls' teams, which is fantastic news. We would like to develop even more teams and to involve more children but the main obstacle that we suffer from is a lack of pitches/amenities. Edlesborough Parish Council kindly allow us to have two 7-a-side pitches on the Green and we have applied for use of a third 7-a-side pitch at Dagnall. Our 11-a-side teams play at Edlesborough School and at Holmans Field in Eaton Bray. It would be wonderful for the future development of the village, children and community if we were to secure our own 'Ground', with 11-a-side and 7-a-side pitches altogether, an all weather pitch and training area, coupled with club house/changing room. We know from talking to Miss Hatfield at Edlesborough School and Nick Evans at Scouts that they would also make great use of such facilities for sporting and outdoor use and this would give the community a fantastic amenity too. We know that we can secure substantial funding from the Football bodies for such a project, so money would not necessarily be as big a hurdle as people might think. If anybody knows of a suitable site we would be grateful if they could inform the Club chairman, Andy Lancefield. Recently we received news that our U15 team have won the Fair Play Award for the 2006/2007 season from the Chiltern Youth League. This is the second time that they have won the award. The U7 team took part in a Mini Soccer Festival at Kempston on 7th July, where the emphasis of the day was to encourage fair play. They were second in the fair play awards for their age group and their manager was very pleased with their performance. Although the organisers stressed that teams would not be judged on results and scores it was encouraging to note that EB Lions won 5 of their 6 matches which bodes well for the coming season. -- Liz Coates, Press Officer, EB Lions AFC. A German Shepherd and a Rottweiler died as a result of the fire at Appledown Kennels in Harling Road, but many more animals were carried to safety, thanks to a huge rescue operation. The blaze broke out in a boarding block, which was housing around 40 pets while their owners were away on holiday. Sixty other dogs in different buildings were unaffected by the drama. Kennel staff have been praised for their quick response to the fire, and a number of volunteers pitched in to lend a hand. Among them was a driver heading home from work, who helped firefighters and staff get the pets to safety. 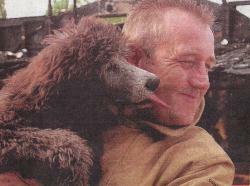 Fire crews were able to quell the blaze, which broke out at around lam yesterday, and move around 40 dogs to safety. Four of them were unconscious, and two of them were dramatically revived using oxygen packs. But sadly two pets died as a result of the flames. Group Commander Ade Feben, who led the fire service operation, said: "I thought we were going to get 10 to 15 dogs killed when we got there. "I honestly didn't think we'd get away with just two." 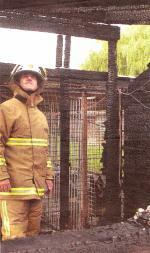 He was full of praise for his firefighters, who went into the burning building to rescue the dogs from their pens. "They did really well, it was incredibly hard work but they did it really well," Mr Feben said. The fire chief added that most dogs were very quiet and restrained as they were being rescued, but quickly perked up when they were outside. He said: "They were all scared, but in all fairness they were fairly overcome by the smoke and that's what made them docile until we got them out. "In all my time I haven't dealt with so many animals in one fire." Mr Feben also said that kennel staff did a great job under intense pressure. There were two staff members on the site when the fire broke out, and they alerted the fire service. As the Herald&Post went to press, investigations seemed to indicate that an electrical fault was the most likely cause of the blaze. A police spokesman yesterday confirmed that it wasn't being treated as suspicious. The kennel's owner, Julie Shelton, was on holiday in Canada when it happened, but she jumped on a plane as soon as she heard the bad news. Her mum, Pam Perry, said the response from volunteers was overwhelming. She said: "It's horrific, but everyone's been brilliant. "It just goes to show what a good place this is, the fact that so many people came to help." The RSPCA were called in to check the animals were safe. Yesterday an RSPCA spokeswoman said that kennel staff had done a "sterling job", and said: "We were very pleased to be there and to be able to help the animals that we did." Owners with pets at the kennel were being contacted yesterday, and all animals were checked by a vet before leaving. Am I the only one who finds Sunday a dreary day? Well, there's no excuse for being bored this weekend, if you're keen on history. History fans are in for a treat in Eaton Bray this Sunday. That's when St Mary's Church is holding an open afternoon - with a pick of the parish record books on view. Some of the record books will date back to the 16th century. And if that wasn't enough to get you out and about, there'll be photographs and background about the history of the church and the village, too. You can drop in between 2pm and 5pm, and refreshments will be on hand. What a great chance to turn back time and forget about the future - i.e., Monday morning! Council officers will today start touring the district on the lookout for unregistered burglar alarms - with fines of up to £1,000 on the cards. Anyone who has an alarm fitted but hasn't told South Beds District Council who their keyholders are will soon face hefty fines as part of a controversial alarm notification policy. The council claims the measure will make it easier to silence endlessly sounding alarms, but critics have dubbed it an invasion of privacy. Under the scheme council envirocrime officers will have contact details for keyholders at their fingertips, so that if an alarm sounds it can be switched off quickly. From today members of the envirocrime unit will be keeping an eye out for alarm boxes on the outside of homes. If they spot an alarm that isn't registered, they will contact the owner giving them seven days to hand over contact details for their keyholders. If this isn't done, owners will face an £80 on-the-spot fine, which will rise to £1,000 if it's not paid within two weeks. When plans were unveiled for the new alarm notification area last year, this newspaper was swamped with letters from readers worried about the impact it would have. One correspondent dubbed it a "sledgehammer to crack a nut", and Eaton Bray campaigner Alan Woolridge mounted a petition calling on alarm owners to withhold the information. His petition read: "For security reasons the only persons who should know of the arrangement are the property owner and the keyholder. "To have such details on the database, regardless of the fact that data will be maintained in accordance with the Data Protection Act 1998, does nothing to inspire confidence." But yesterday a council spokeswoman announced that 4,578 alarms have been registered in South Beds. Councillor David McVicar, portfolio holder for the environment, said: "This service means that our neighbours no longer have to endure the possibility of constant noise of alarms while we are on holiday or away. "It is a simple matter to register your alarm, giving yourself and your neighbours peace of mind." You are viewing the August 2007 archive.